This ornate shopping arcade was built in 1899 to designs by G.J. Skipper. It has colourful ceramic tile facings and a glass and timber roof. The entrance has stained glass in the semi-circular top. There are bowed shop fronts to each side of this entrance and the two storey arcade interior has projecting timber shop fronts. This Art Nouveau building was restored in the 1980s. 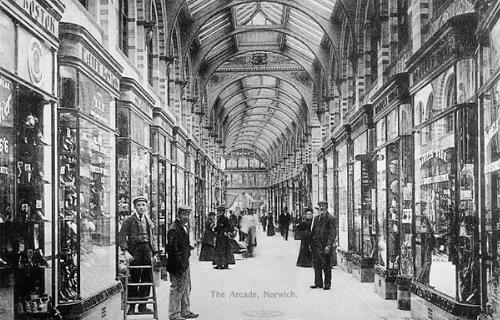 Shopping Arcade. 1899 by G. J. Skipper. Ceramic tile facing. Slate and plain tile roof to shops. Glass and timber roof to arcade. Three storeys. Arcuated entry with stained glass in the semi-circular top. Bowed shop fronts to each side of entry with three two-light casements at first floor. Curvilinear pediment. 20th century shop front to left-side with two-storey corner oriel above and two four-light mullion and transom first floor windows. Curvilinear pedimental right angles to arcade entry. Two storey arcade interior with projecting timber shop fronts. Press cuttings (S1), (S2) and (S3) in file. --- Newspaper Article: Eastern Daily Press. 2009. City's Mustard Shop saved. 3 August. --- Newspaper Article: Eastern Daily Press. 2012. Look up and admire the man (George John Skipper). 21/12/2012. <S1> Newspaper Article: Eastern Daily Press. 5 Dec 1992. <S2> Newspaper Article: Eastern Daily Press. 20 Sept 1991. <S3> Publication: Norwich Mercury. 7 Jun 1996.